Ten years gone by my teaching career. Ten years since Katrina. Ten years of experiences from which to learn and improve. I’ve been saying for years and continue to say that I will not stay in New Orleans forever. When the experiences start getting stale here I’ll pull myself away and find some new unfamiliar part of the country or world. But for now, this is still the right place for me to be. For the second time I started the summer by flying out to Kansas City and joining 800+ other Math teachers to score 400+ thousand AP Calculus exams. During my first year of scoring I appreciated the experience for (1) giving me an occasion to nerd out with other people who teach the same subject that I do, and (2) providing me with the insight that I shouldn’t get too frustrated with some of the ridiculous mistakes that my students make since it turns out countless students across the country err in the same way. This year I had another revelation. I pondered why I could score these tests all day long for seven days straight without getting tired, yet I dread scoring my own students tests which exhaust me relatively quickly. The answer now seems obvious: (3) The emotional investment in my own students success weighs heavily. In contrast, it’s so easy to grade a stranger’s test with cold, unflinching efficiency. The anonymity is fantastic: When I open an AP exam booklet to lousy work, it’s so easy to just record the lousy score and move on to the next one without a second thought. The kids’ names don’t even appear on the exam booklets – only several identifying numbers bubbled into a scantron grid. I’ve thought of trying to grade my students’ tests anonymously, but I’d inevitably learn to recognize their writing. And even without knowing the specific name attached to any given test, I’d know it’s someone who would be disappointed in a poor score (Or if they were not disappointed, I sure would be). Of course the double-edge of emotional investment cuts in a good way too. 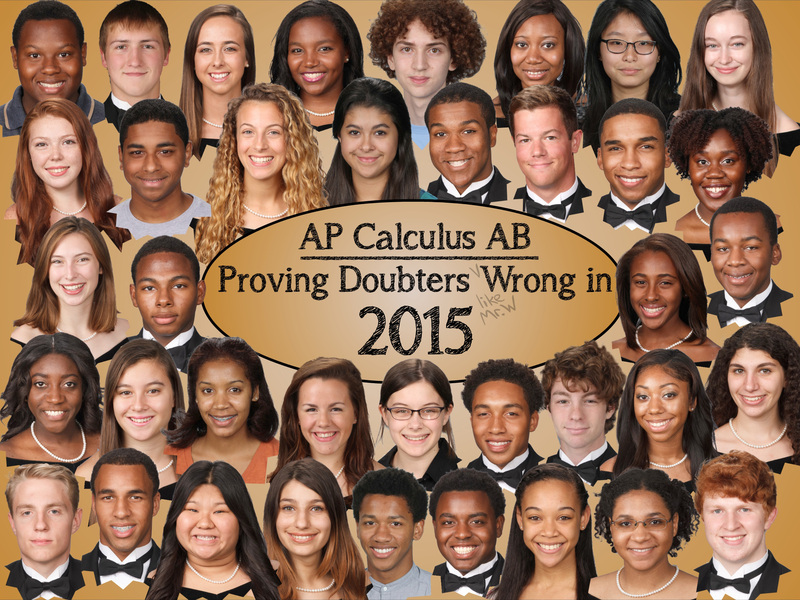 My expectations were a bit low for my 2015 AP Calculus AB roster. I always have some high performers, but overall I hadn’t been overwhelmed with their performance during the previous PreCalculus year. I told them so and challenged them to prove my lackluster predictions for them wrong. In fairness, I could have looked at it in a positive light that a number of low- to medium-performing students even chose to take AP Calc in the first place. My roster of 38 was significantly larger than it had been in any previous year. The road was rocky at times, but on the whole I saw a lot of students persist in the face of a daunting challenge. Only a few teetered on the edge of giving up. Most braved the struggle, and when the scores arrived in early July I was truly impressed. As always, I don’t think any test score can accurately encapsulate a student’s learning experience. 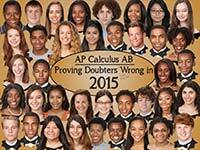 However, one doesn’t pass that brutal AP Calculus exam by dumb luck alone. The class mean was 3.71 (second only to my stellar 2014 roster) and the rate of those passing with a score of 3 or higher was 87% (highest of my career, even edging out the 2014 class). More than the matter of earning college credit for their efforts, this group convinced me that they are entering the next phase of their lives with more courage and determination than I had initially given them credit for. All the times I agonized over grading underwhelming tests during the school year only made it that much sweeter to send them off from high school on a high note. I feel a bit guilty mentioning my five AP Calculus BC students almost as an afterthought. 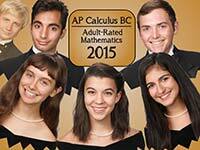 They did an outstanding job on the AP exam, earning four 5s and one 4. In that very small class I got the opportunity to teach more flexibly and cater to their individual strengths and interests more than I can with a larger roster. From them I discovered some ways to vary my repertoire and inspire me to continue the refinement with my incoming BC class of six. The emotional investment is what pays great dividends and reenergizes me to start my 11th year as a teacher. A year ago the Lusher school campus started undergoing a “stabilization project” that moved the middle school classes out to trailers in the courtyard. The high school moved over to the original middle school side of the building while a year was spent fixing up our side of the 84-year-old building. The jet-engine-sounding floor-to-ceiling A/C units in each room were replaced with a central air system. The windows which had leaked water into many classrooms during wet weather were replaced in all rooms. The old windows had been spray painted over by previous occupants of the building, presumably as a cheap alternative to blinds or shades, and the sudden influx of natural light now is stunning. A little too stunning in fact. Shades have still yet to be installed, so most of us have utilized posters or butcher paper to keep the morning sun from blinding us until the shades arrive. The old bathrooms have been completely redone, the termite damage and plaster crumbling from the walls has been replaced, and many other refinements have been implemented. Now as we start the 2015-16 year, it’s refreshing for the high school to be back on our newly-renovated sided of the building. Contractors are currently working on the middle school side with expectations of wrapping up the project by the middle of the academic year. Naturally the multi-step moving process added stress and I’m glad to leave much of last year behind. The year was not without some fun memories though. During Mardi Gras in February a rare privilege fell in my lap. Krewe of Muses puts on one of the most popular parades in all of Mardi Gras with 1000+ all-woman float riders. I’m told that only one time before has a man been allowed to ride on a Muses float. 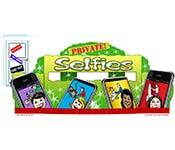 A shadow box had been introduced on the front of one float several years prior. A performer of some type, consistent with the year’s theme, would then ride inside the box with a forward-facing spotlight projecting their shadow onto the translucent walls. Apparently in 2014 a short, rotund man was recruited to be inside the shadow box and change into various women’s clothing throughout the 4-hour parade. My neighbor Sandi paints floats for Muses and thought of me when she found out that for 2015 a tall, skinny man was wanted for shadow box duties. The catch: The Muses theme this year was based on the book “Are You There God? It’s Me, Margaret” with whimsical floats designed to capture the angst of growing up and growing older. 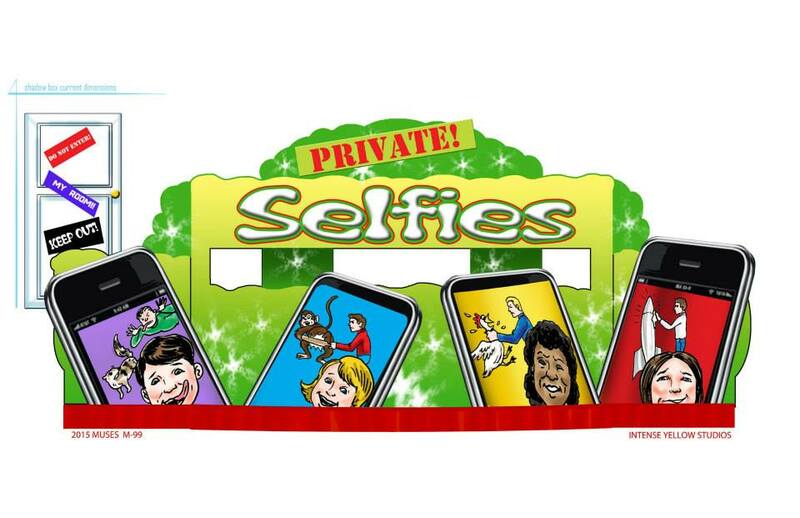 This year the shadow box would be mounted on the front tip of a “Selfies”-themed float that would have cartoons on the side of a young man literally spanking a monkey, another guy waxing a rocket, a third choking a chicken. The metaphors were intended to go over the heads of young children, but they certainly wouldn’t be subtle to adults. My mission, should I choose to accept it (and of course I did) was to dance suggestively (but not too suggestively) in the box as if I was taking a self-gratifying shower. I was allowed to recruit a friend to share in the duties so that we each could take breaks and admire the view from a perspective that hardly any other men would ever get to see. And sure enough I had a blast. I was surprised that I could not see my own shadow from the inside of the brightly lit box. I could only improvise my dance moves in response to the thumping pop music blasting from the float’s speakers and trust that I was communicating the appropriately inappropriate vibe to the massive crowds along the route. I told only a few people beforehand and for better or worse didn’t arrange in advance for anyone to capture the moment from the audience viewpoint. I was content with letting this be my own fun experience and I didn’t feel the need to advertise it extensively. After the fact I came across a few low-resolution photos and videos of my performance. (1) sketch for all the Muses 2015 floats originally found here, (2) sketch for the "Selfies" float originally found here, and (3) the only photos I have of my role in the Muses 2015 parade. I also came across this cell phone video, and this other cell phone video. Nerd-out sessions – especially the ones that arise organically from classroom happenings – provide some of the most satisfying moments of any school year. Last year was no different. Early in the school year I had a Calculus student, Ari, whose father recalled a puzzle from his younger days in Greece. The question involved finding a function f(x) such that f´(f´(f´(f´(f´(x))))) = x. At first I, like most of the people I ultimately showed it to, mistook the left side of the equation as representing the fifth derivative of f(x). That wouldn’t be a hard problem to solve. Upon further thought though, I realized that this involved successively composing a derivative inside another derivative expression – an entirely different and more challenging question. I attempted a solution several times over the following days but kept coming up short. Then one night I found myself dreaming about Math, which is not unusual. This problem crept into my dream, but rather than thinking of it algebraically as I had during my conscious hours, during sleep I found myself thinking about it graphically. Inverse functions crossed my mind. In particular, the property that a function and its inverse “undo” each other when composed such that f(f -1(x)) = x. Graphically, functions and their inverses are reflections of each other across the line y = x. Then it occurred to me: If a function’s derivative turns out to be equal to its own inverse, then expressions such as f´(f´(x)) by definition equal x. So, if the graph of f´(x) is a function that is symmetric about the line y = x, then the question may be reduced down to simply f´(x) = x, which has a solution of f(x) = 1/2 x2 + C. Furthermore, if the question is altered such that there are an even number of f´ in the composition, then the question reduces to simply x = x, and any f(x) whose derivative is symmetric about y = x satisfies the given equation. All this realization occurred calmly in my sleep. Even more startlingly, I was able to recall it clearly when I woke up! The question still remains: Are there more solutions than those I’ve described? I could easily imagine there are, but that doesn’t diminish the thrill of my discovery. While I don’t expect the average non-Math-head to share my joy in this occasion, true nerds can appreciate what a momentous big-baller moment this is to be able to say that I actually solved (partially, at least) a Math puzzle in my sleep. Most of my nerding-out involved more conscious endeavors. Another student, Stella, asked me about the well-known claim that a normal-sized piece of paper can only be folded in half no more than 7 or so times. She asked if that could be proven Mathematically. I tried to push the question back to her and encourage her to figure it out with only a few hints of how I might consider approaching it. When she didn’t find the time and/or interest to fit it in with her other school obligations, I aimed to derive a formula myself that would give the maximum number of times one could have a piece of paper with dimensions of A x B and a thickness of t. How giddy was I when my formula turned out to agree with various experimentally-determined numbers, including the oft-cited limit of 7 for an 8.5” x 11” piece of standard printer paper. Of all my nerd-out sessions in the past year, the one I’ve delved into most deeply started with an email from a stranger in early June. He had somehow stumbled upon some of my Web postings about finding Mathematical equations whose graphs create relatively complicated pictures. The stranger worked in some pocket of the entertainment industry in Hollywood and wanted to hire me to create an equation that graphs out his signature logo: a stylized letter f. I declined payment, preferring instead to indulge in it for exactly as long as I wanted without money obliging me to go any further. I tried a number of different approaches, but the one I spent the most time on involved parametric functions. While it wasn’t too hard to come up with a pair of piecewise functions for x(t) and y(t), to stop there struck me as inelegant and lacking of worthy challenge. Instead I set out to develop a pair of non-piecewise functions. This goal proved elusive at times and I almost determined that it was beyond the scope of what I could do. Part of the task required finding a continuous function that is sinusoidal over a given interval, but outside of that interval consists of just a horizontal line. Once again the solution drifted into my head late one evening while lying in bed (rested, but not fully asleep this time). I had already found a way to make “polyline” functions that consisted of multiple line segments of varying slope joined at their endpoints. I suddenly realized that composing such a polyline function inside of a sinusoid equation would allow me to achieve my objective. The emailing stranger very much liked what I sent his way over the following couple months and requested that I somehow incorporate mysterious elements related to the Pyramids, pi, and the golden ratio into the equations. I obliged for a while but eventually veered off to develop a lesson for AP Calculus BC class based on this excursion. It just so happens that parametric equations are one of the first topics that I planned to teach this year in that class, and this experience provided me with plenty of material with which to make a much more interesting series of lessons than I had used last year. As always, the most rewarding part of the summer was catching up with former students. I lost count this year. I saw at least twenty, ranging from those just about to start their first year at college to recent college graduates. About half of these were scheduled lunch meetings while the other half where chance encounters that sometimes turned into extended conversations. This is what has motivated me and will most likely continue to fuel me as I steadily march along into my second decade as a Math teacher.